The BMW X3 line-up is a formidable collection of SUV/AWD vehicles designed to work hard, play hard and look good, all at the same time. However, if you’re really serious about going off road if you have to do a lot of towing – one of the big reasons why people choose to purchase a bigger vehicle like the BMW X3 2.0d – then a diesel engine has plenty to recommend itself. This is not to say that the petrol variants of the punchy BMW X3 aren’t good cars, but the X3 2.0d takes it up another notch or two. The unit in question that sets the BMW X3 2.0d apart from its stable-mates is a compact and efficient 2-litre four cylinder diesel engine. While smaller and not quite as twisty as the six-cylinder unit in the bigger X3 3.0d, the 2.0d’s 330 Nm is probably plenty for most people driving the open road with a bit of overtaking or towing (but not, hopefully, both at the same time, unless the alternative is being stuck behind a snail-paced tractor). Top power in the BMW X3 2.0d is 125 kW. When it comes to the 0–100 sprint, the BMW X3 2.0d can do it in under 10 seconds (9.3, to be exact), which is pretty good for an SUV of its size and class. Two transmission choices are offered for the BMW X3 2.0d: six-speed manual and six-speed auto. Economy in the BMW X3 2.0d is excellent for this class of vehicle: 7 litres/100 km, with claims of 6.8 litres/100 km. These performance figures have been enhanced by an overall weight reduction of 20 kg, which may not sound like much but has managed to make the new BMW X3 2.0d 10 kW more powerful and using 10% less fuel. In line with modern trends to reduce environmental impact and CO2 emissions, the BMW X3 2.0d’s engine is fitted with particle filters (as are all BMW diesel engines) and it meets Euro 4 emissions standards – the BMW X3 2.0d emits 185 g/km of CO2. 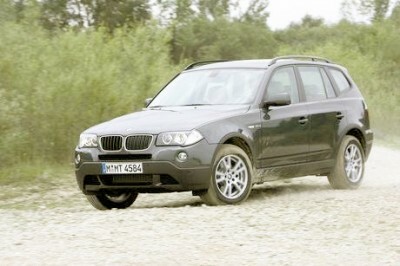 And, like other modern diesel engines, the BMW X3 2.0d can be run on a biodiesel blend. Like other X3s, the BMW X3 2.0d has BMW’s xDrive all-wheel drive system which is able to adapt itself automatically to the driving terrain in order to maintain traction. Combine this with the Dynamic Stability Control, the Dynamic Traction Control, Hill Descent Control and Cornering Brake Control (which interacts with the ABS braking system) and you have one very, very safe and responsive road-hugger. Or off-road hugger, as the case may be. Throw in pyrotechnic pretensioned seatbelts with load limiters and anti-submarining ability in the front, and side, front and curtain airbags (side airbags are options for the rear seats) for an extra-safe vehicle that you’d be happy to trust your life to in an emergency. The interior of the BMW X3 2.0d is Comfort City, with ample headroom, leg room and elbow room for all. The BMW X3 2.0d has climate control, electric windows, alloy wheels and cruise control as standard, along with the radio/CD stereo system with 4 speakers and an auxiliary jack. Other features include the 16:9 monitor for navigation (which has a TV function), and a roof-mounted DVD screen with games console connectivity – and cordless headphones so the driver can listen in peace to whatever they fancy while the kids play games involving crashes and cop cars with wailing sirens in the back… without reducing you either to a nervous wreck or to the point of ignoring a real siren behind you. Looks-wise, the BMW X3 2.0d is the same as the rest of the X3 range: stylish and tough all at once, with looks that promise performance, comfort and efficiency in the one vehicle. And the BMW X3 2.0d can certainly deliver on that promise. For anymore information on the BMW X3 2.0d, or for that matter any other new car, contact one of our friendly consultants on 1300 303 181. If you’d like some fleet discount pricing (yes even for private buyers! ), we can submit vehicle quote requests out to our national network of BMW dealers and come back with pricing within 24 hours. Private Fleet – car buying made easy!